One week on, I have been reading a lot of wonderful stories on the interweb about ‘the tennis game of the century’ and that tennis will never be the same. Thank you to the many blogs that have brought tears to my eyes with the tirade of compliments thrown at both men, and the sport. In what was an epic war played out for just under six hours, Novak Djokovic finally beat Rafael Nadal to win the Australian Open. For all of us worldwide, who stayed glued to the TV or even sat through the rain in Federation Square in Melbourne, this made me reflect on these men, who are not really men, but Gods. They are NOT human. They cannot be to endure the physical and mental torture, not for an hour, not for two, but for just less than six. Yes… six grueling and dueling hours of battle, strategy and will. Think of the pain they went through. Us ordinary folk would have given up. Not these guys. Bleeding feet, muscle spasms, chomping on a banana and some protein bars for energy. What were they thinking? We love our sports heroes: no matter the different codes. Courageous, hearts of lions, amazing memories to remember their competitors’ weaknesses and strengths and spirit. 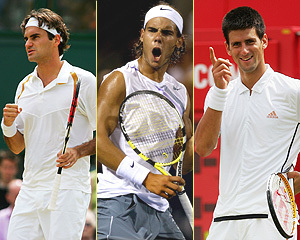 Let’s look at the men’s tennis elite athletes. Andre Agassi, Jimmy Connors, Ivan Llendyl, Roddick, McEnroe, Becker, Pete Sampras, Borg, our own heroes Rod Laver and Lleyton Hewitt… but the contemporary lads now who rule the court: Nadal, Federer and Djokovic. They are THE best, most revered, most respected. But they also possess heart, brains and brawn. Which made me think about the Wizard of Oz characters (circa 1939: http://en.wikipedia.org/wiki/The_Wizard_of_Oz_(1939_film). The Lion wants bravery, Scarecrow wants a brain and Tin Man, a heart. Aren’t these three traits those that these amazing tennis Gods possess? And not just a little of each. Without these characteristics, they’d just be ordinary beings. Imagine having to withstand the mental strain, pain and being brave for nearly 6 hours? That’s why we call them heroes. Hahaha, I know Nick!!! I’ve been neglecting WordPress… hope you are fab!